Ducati's tradition of building racy red superbikes means that the term 'sports- tourer' has a distinctly different slant in Bologna. 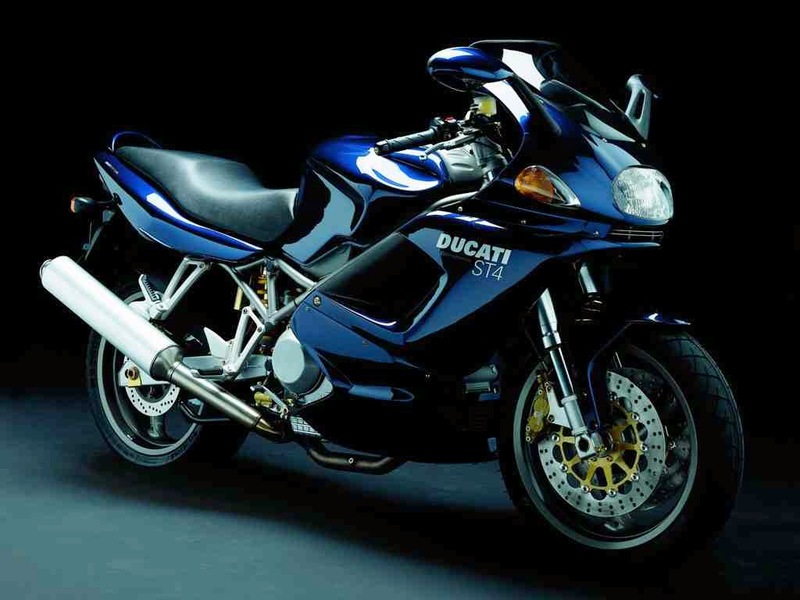 Not for Ducati the classical balance between long-distance comfort and speed. The Italian firm's idea of a sports-tourer is a fast, light V-twin... just softened slightly with higher handlebars plus room for a pillion. That approach was exemplified by the ST4S, which was introduced in 2001 to head the Italian marque's growing family of sports-tourers. The ST2, with its 944cc liquid-cooled, sohc two-valves-per-cylinder V-twin engine, had been introduced in 1997. Two years later it had been joined by the ST4, powered by a modified version of the more powerful dohc eight-valve engine from the 916 sportster. Essentially the ST4S was a sportier version of the ST4, complete with larger capacity engine and revamped chassis. Although the S model looked restrained, there was a heart of fire beneath its grey bodywork. This sports-tourer was slightly more powerful and not much heavier than the iconic original 916, with which the Italian firm had stepped up its bid for road and race glory in 1994. Ducati did not need to look far to find a powerplant for the ST4S. At the same time as the 916cc ST4 had been launched, the 916 sportster had been upgraded with a bigger, more powerful 996cc engine. 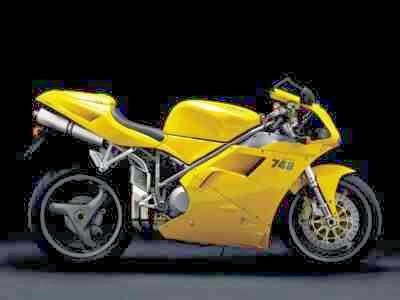 To create truly rapid sports-tourer it was a simple task to bolt the 996 model's desmodromic V-twin motor into the DUCATI ST4 chassis, after first fitting more compact cylinder heads, plus new intake camshafts that improved low-rev performance. Peak power was 117bhp, and the ST4S was at least lObhp stronger than the ST4 everywhere above 4000rpm. Ducati's intention was to give the ST4S a torquey V-twin feel, plus plenty of high-rev speed and acceleration - and that's just how the bike performed. The S model didn't really start charging until about 6000rpm, by which time it was travelling at about lOOmph (161km/h) in top gear on the way to a maximum speed of 160mph (257km/h). But there was smooth torque on tap from as low as 3000rpm, and a slick six-speed gearbox to help out. The basic ST4 was no slouch, but the S-bike combined an identical tubular steel frame with superior titanium-coated fork sliders (for reduced friction), an Ohlins rear shock with hand-adjustable preload, lighter wheels, an aluminium swingarm and stickier rear tyre. On standard settings the bike was comfortable but fairly soft. Given some suspension fine-tuning it became superbly taut, its pace on a racetrack limited mainly by the centre-stand's tendency to dig in at extreme angles. 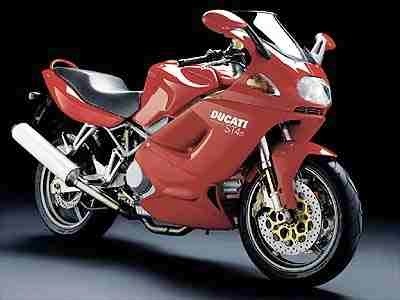 That centre-stand confirmed that Ducati ST4S sports-tourer did have a few compromises to comfort and practicality. Other civilizing touches included a fuel gauge and clock in the cockpit, ignition immobilizer, reasonable wind protection and fuel range, large dual-seat and plenty of leg room. For riders looking for all-round ability plus performance and agility that would have been cutting edge just a few years earlier, the ST4S was a tempting combination.